Simon Lambert of Peterborough Panthers leads heat four in the meeting against Great Britain. Photo: David Lowndes. A winning start to the 2015 season came at a huge cost to Peterborough Panthers today (March 15). A 48-45 success against a Great Britain Select side in their curtain-raising Challenge clash at the East of England Showground was overshadowed by a horror crash involving Adam Roynon in the very first race of the new campaign. Roynon was knocked unconscious by the impact of the first-lap accident after he had clipped the machine of visiting number one Richard Lawson leaving the second bend. He was treated on the track before being taken to hospital complaining of back and arm pain. Team boss Carl Johnson said: “It is a huge blow to lose a rider after only two bends of the first race of the season. “Adam has been really unfortunate down the years with some very nasty injuries and it is a cruel blow for him to be hurt again. “He is a lovely lad who was really looking forward to this season and desperate to do well to get his career going again. “Unfortunately injuries are part and parcel of the sport but I’m sure everyone connected to the club, and the speedway family as a whole, will wish him all the very best and hope it is not too serious. On a brighter note there were terrific starts for two winter signings at opposite ends of the Panthers team as they secured victory with a race to spare. New number one Olly Allen marked his return to the club with a hat-trick of heat wins before seeing his hopes of a maximum ended when on the receiving end of a 5-1 in heat 13. And reserve Simon Lambert also racked up a treble of his own during a busy shift which yielded 11+1 points and even included a heat 15 outing in a meeting run of the heat format used at Elite League level last season. That duo were joined in double-figures by the ultra-consistent Lewis Blackbird whose first meeting since he suffered a serious injury last August produced five second places. Teenage sensation Robert Lambert claimed the first heat victory of his Peterborough career with a scorching showing in heat 11 while Ollie Greenwood impressed on his return to the club with a solid shift at reserve. He and bottom-end partner Simon Lambert contributed paid 21-point between them. It meant captain Ulrich Ostergaard found himself in the unusual position of being the club’s lowest scorer (other than the withdrawn Roynon) with four points from as many outings. Johnson added: “We wanted to start with a win and it is particularly pleasing to do that after the adversity of losing Adam so early on. Panthers kick-off their Premier League Cup campaign with a home clash against Somerset next Sunday (March 22, 1pm start). 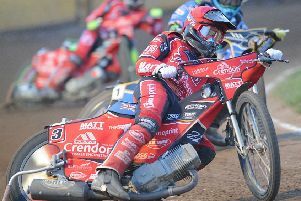 PETERBOROUGH READYPOWER PANTHERS: Simon Lambert 11+1, Lewis Blackbird 10+1, Olly Allen 10, Ollie Greenwood 8+1, Robert Lambert 5+1, Ulrich Ostergaard 4, Adam Roynon 0 (withdrawn). GREAT BRITAIN SELECT: Richard Lawson 15+1, Kyle Howarth 8, Adam Ellis 7+1, Richie Worrall 6+1, Lewis Rose 5+1, Nathan Greaves 2, Lewis Kerr 2. 1 - re-run: Allen (61.7), Lawson, Ellis, Roynon (fell/exc). 3-3, 3-3. 2 - S. Lambert (62.7), Rose, Greenwood, Greaves. 4-2, 7-5. 3 - Ostergaard (61.9), Worrall, R. Lambert, Kerr. 4-2, 11-7. 4 - S. Lambert (62.4), Blackbird, Ellis, Rose (ret). 5-1, 16-8. 5 - Allen (61.5), Kerr, Ostergaard, Howarth. 4-2, 20-10. 6 - Lawson (tac ride, 61.5) Blackbird, Worrall, R. Lambert. 2-7, 22-17. 7 - Howarth (62.6), Greenwood, Greaves, S. Lambert (ret). 2-4, 24-21. 8 - re-run Ellis (62.9), Blackbird, R. Lambert, Kerr (fell/exc). 3-3, 27-24. 9 - Greenwood (63.2), S. Lambert, Greaves, Rose. 5-1, 32-25. 10 - re-run: Allen (63.4), Rose, Greenwood, Worrall (fell/exc). 4-2, 36-27. 11 - R. Lambert (61.5), Howarth, Lawson, Ostergaard (ret). 3-3, 39-30. 12 - S. Lambert (62.6), Ellis, Rose, Greenwood. 3-3, 42-33. 13 - Lawson (61.7), Worrall, Allen, Ostergaard. 1-5, 43-38. 14 - Howarth (63.4), Blackbird, Greenwood, Greaves. 3-3, 46-41. 15 – Lawson (62.8), Blackbird, Worrall, S. Lambert. 2-4, 48-45.